In Bravil lies the home of the Lucky Old Lady and a "lucky" Bosmer, and today fortune shines on both... but only one shines back. Find the next dead drop. Learn of your new target, Ungolim. The dead drop for this quest is located just inside the Ayleid ruin of Nornal. Go around the first set of semi-circular steps, and off to the right is a half submerged gate. Pick the lock, jump the gate, or search the ruins for A Rusty Key; the dead drop is in an underwater area behind the gate. A copy of the key can also be found in the Leyawiin Mages Guild, on the second floor. Your 7th Dead Drop Order involves the assassination of a Wood Elf named Ungolim in Bravil. 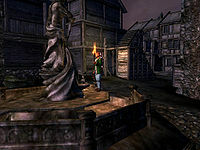 He visits a certain statue there - the statue of the Lucky Old Lady - every night between 5pm and 1am. During the day he can be found in his house, however the door is locked and can only be opened with the key, which he carries. Although difficult, you can pickpocket the key from him before the quest begins. He is expecting trouble, and he has paid off the guards so that they will not interfere whenever things get nasty. The moment you set foot in Bravil at night, Ungolim will attack you on sight with his bow. You do not have to worry about getting a large bounty or getting into additional fights with the Bravil guards due to Ungolim's bribe. Simply kill Ungolim however you see fit to complete the contract. If you are having trouble with Ungolim pelting you from afar, simply run over to the main gate and stand behind one of the guards - due to the way the AI follows you with a bow, it's no problem to just sidestep behind a guard right as Ungolim fires, sending the arrow into the guard. Despite the bribe, this will still cause all of the Bravil guard to attack Ungolim. As soon as the kill is made, Lucien Lachance will appear and approach you. Make sure, when you kill Ungolim, to be at a place where Lucien can access you afterwards. If you stand on a rooftop while killing Ungolim, you'll see the text about Lachance coming but will not be able to move. You can fix this problem by putting enableplayercontrols into the console; it's then possible to jump down to where Lucien is, speak with him and continue. 20 Ungolim is dead. I must now journey to the city of Anvil, and pick up my reward and next contract at the dead drop there. It is located in the barrel just behind the pond, in the city of Anvil. 100 Finishes quest I was intercepted by Lucien Lachance shortly after Ungolim was killed. It is possible to use the console to advance through the quest by entering setstage Dark16Kiss stage, where stage is the number of the stage you wish to complete. It is not possible to un-complete (i.e. go back) quest stages. See SetStage for more information. Esta página foi modificada pela última vez à(s) 02h30min de 20 de fevereiro de 2015.